I have been blessed with this amazing opportunity! I have been asked to give my opinion, sort of a review, for Graco’s new airless sprayer. 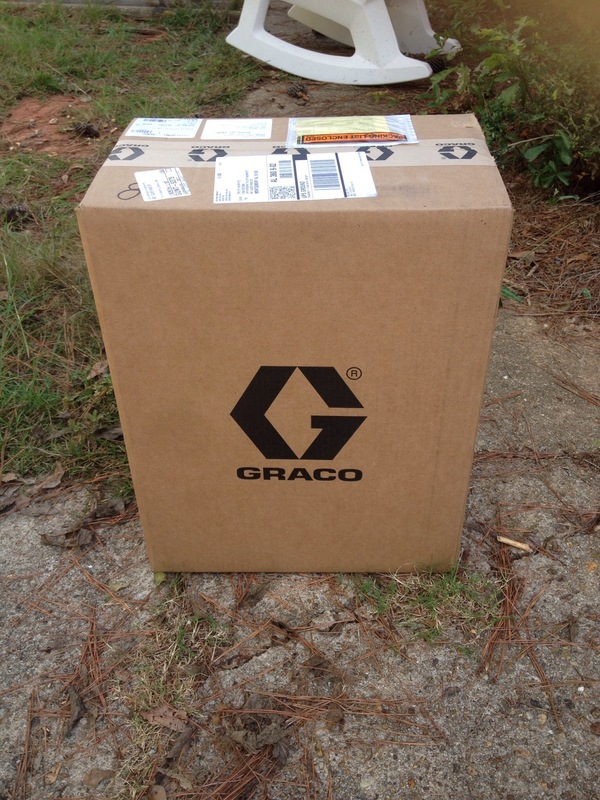 I received this box from Graco’s a few weeks ago and I couldn’t stop smiling all day! I felt like a fat kid in a candy shop! Open it up, open it up!! The TrueCoat 360 DS by Graco. I’m told that this airless painter was specifically designed with the DIYer in mind, and believe me it did not disappoint. The painter is lightweight with a comfortable grip. 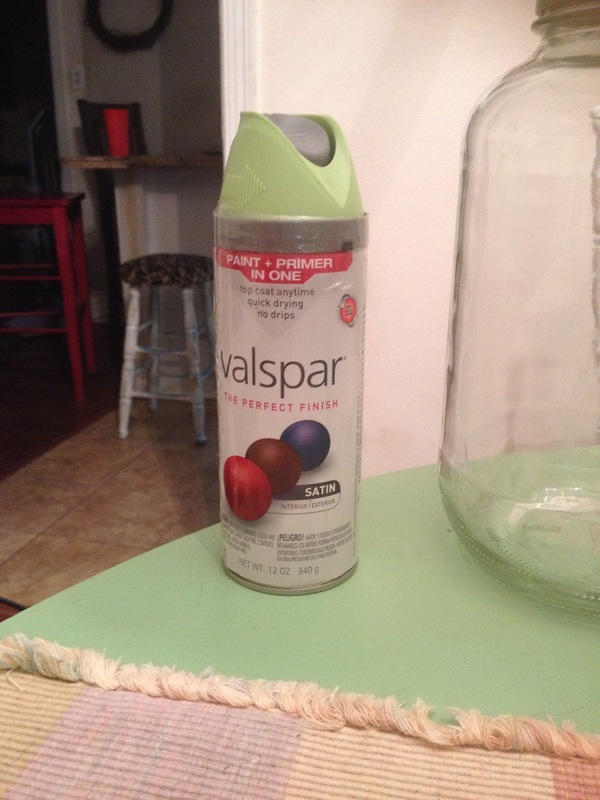 The spray tip allows you to spray horizontally or vertically but wait, there’s more. The Graco TrueCoat 360 Ds has an exclusive FlexLiner Paint Bag System that not only makes set up and clean up easier it allows for spraying from any angle. 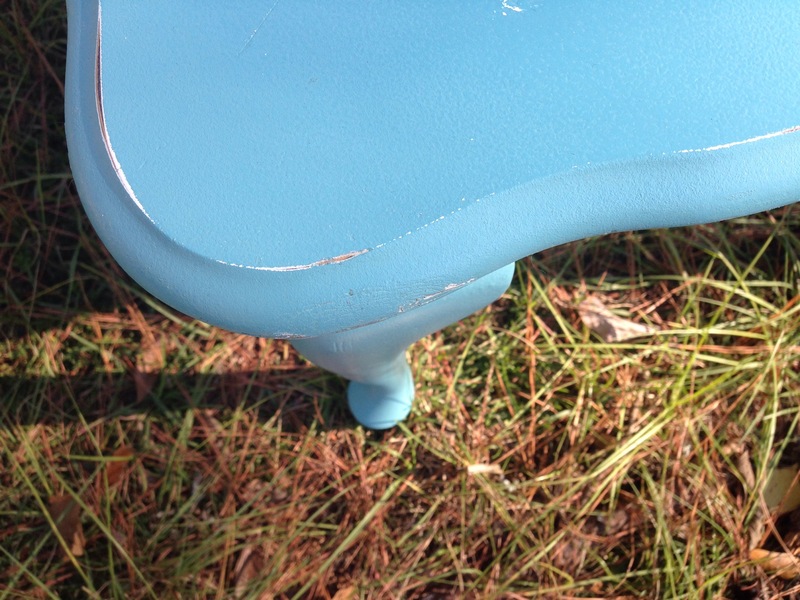 Graco has also given the customer a choice of reusing the paint bag or just tossing it out. The company boost that there is no need for thinning your paint and that a wide variety including oils based, paint and stains can be used with the airless paint sprayer. 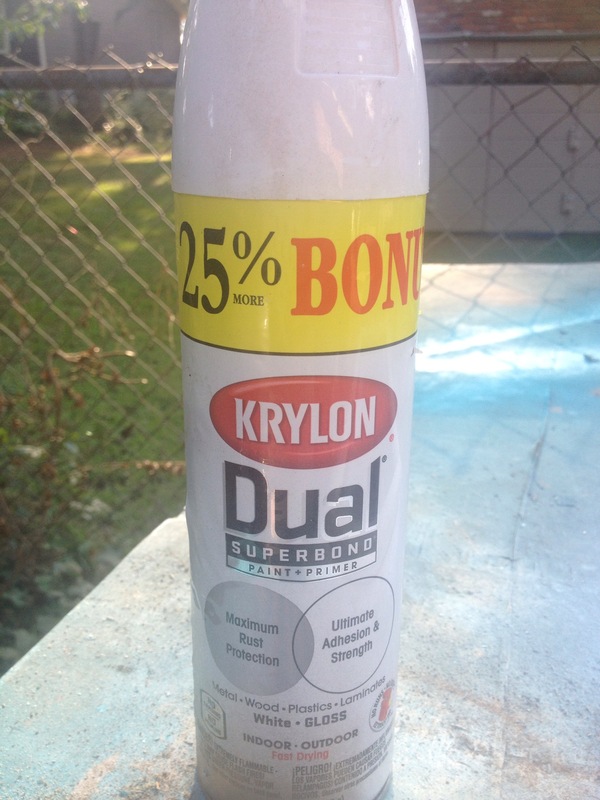 With this in mind I decided to use primer in the sprayer, the first time I used it. Well folks, our friends at Graco have done it again! 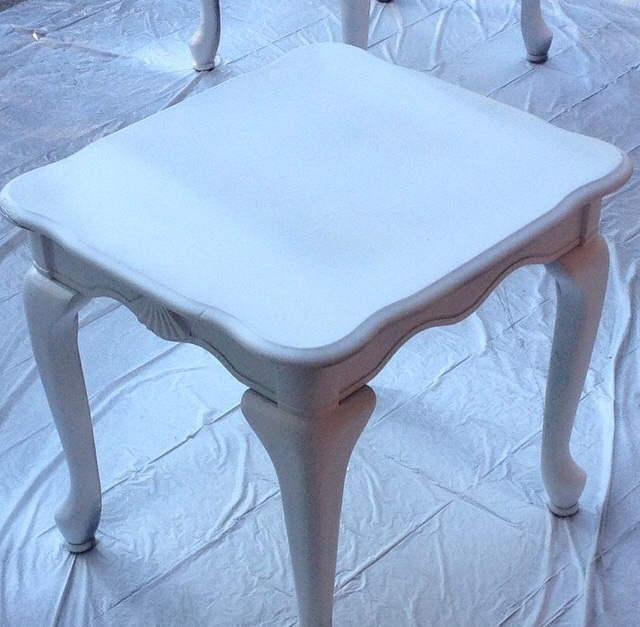 My first coat of primer was even,smooth and with no drips!! You say I’m too EXCITED!! by the possibilities not to mention the doors this sprayer is going to open for me. 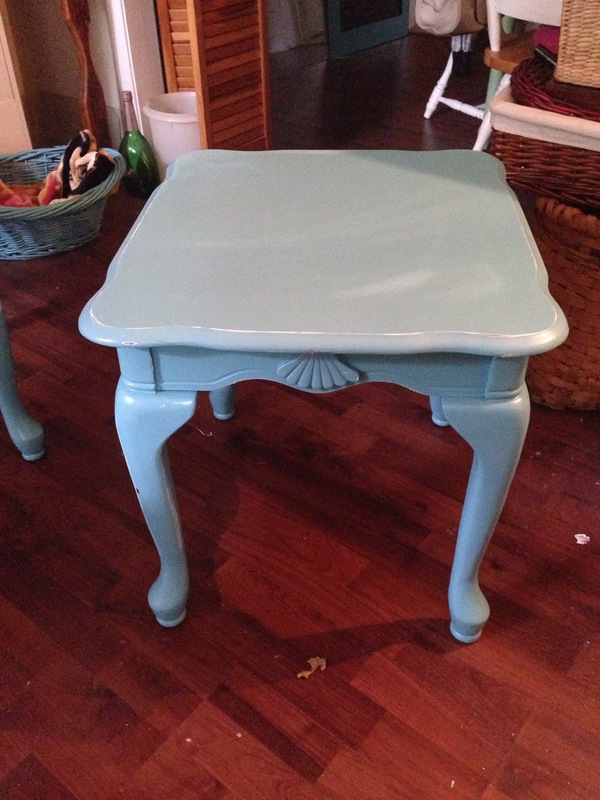 Here’s another look at the tables after they were sprayed a few days later with a Tiffany Blue color latex paint using the same paint bag I used when I primed them (with a light distressing). The company suggests warm water or mineral water to clean the gun and bag after each use. 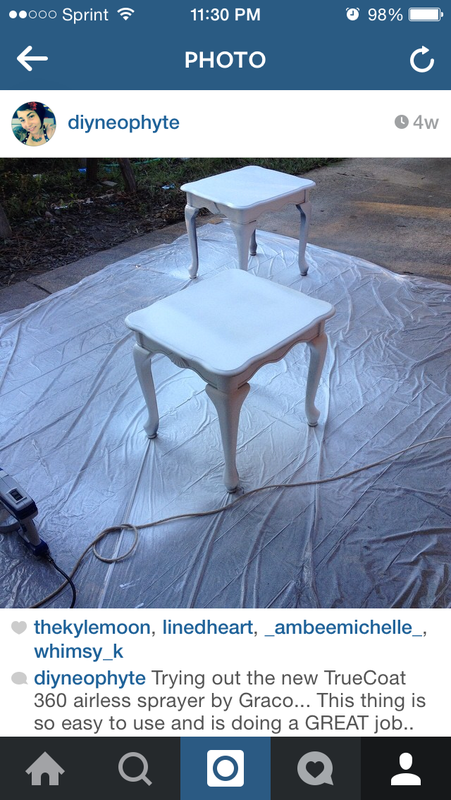 The warm water worked for me with both the water based paint and primer. This picture was taken outside and is a little more truer to the actual color of the tables. 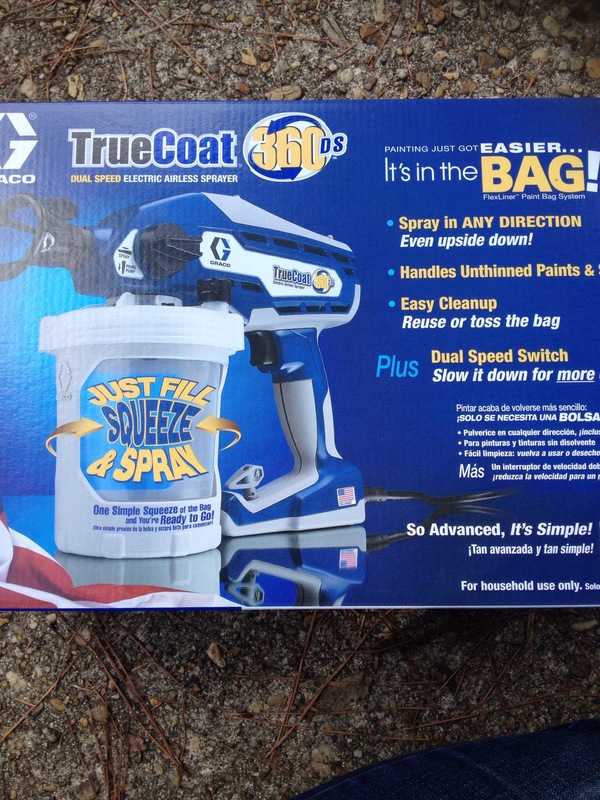 The Graco TrueCoat 360 DS Airless Sprayer can be purchased from Lowes or online through Amazon. 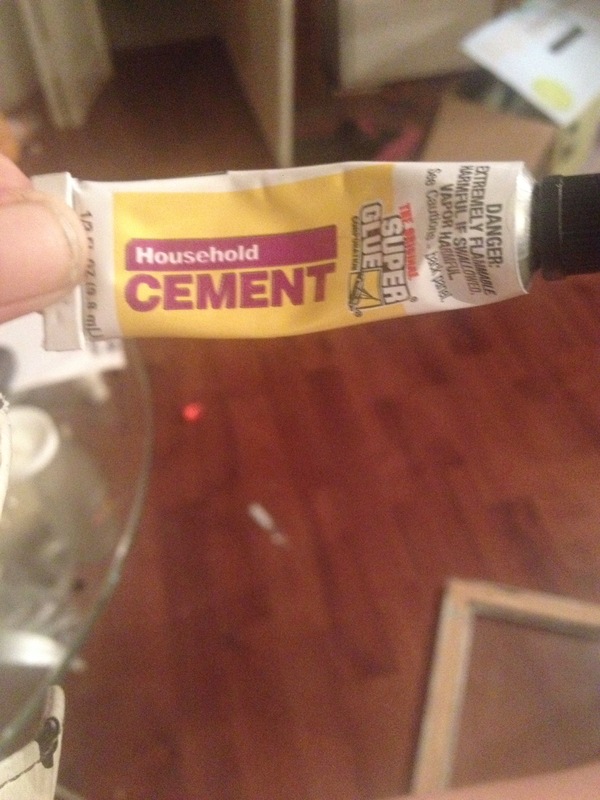 Believe me fellow DIYers this is a must buy for all your painting needs. All opinions are my own. The TrueCoat 360 DS was sent to me by Graco to be reviewed. I received no monetary compensation from Graco. Ok if you read my last post, you know my last post got deleted somehow. So let’s try this again. I have a new obsession with Mantles. 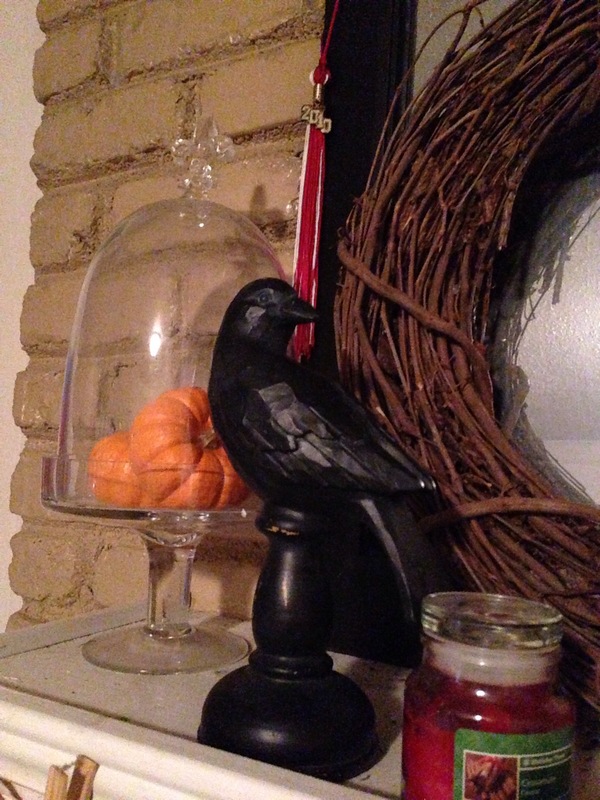 I actually attempted my first try at decorating my mantle for Halloween. You can read all about it here. I loved the way it turned out and I hated to take it down. I certainly didn’t want to leave it up til Thanksgiving though,so I decided to try it again. Here she is, all prettied up for Fall. 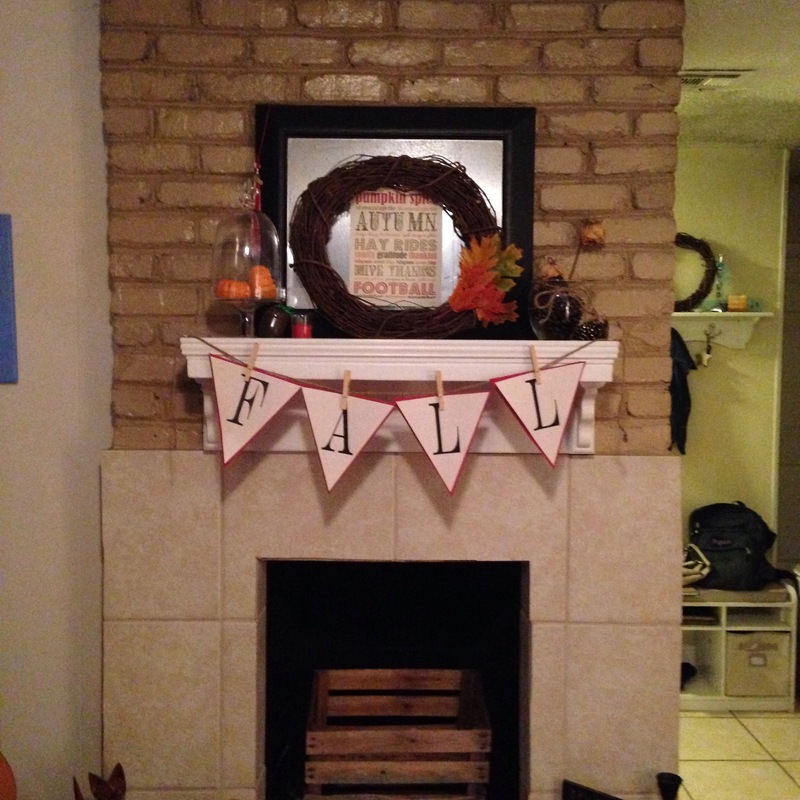 This mantle cost me nothing to make. 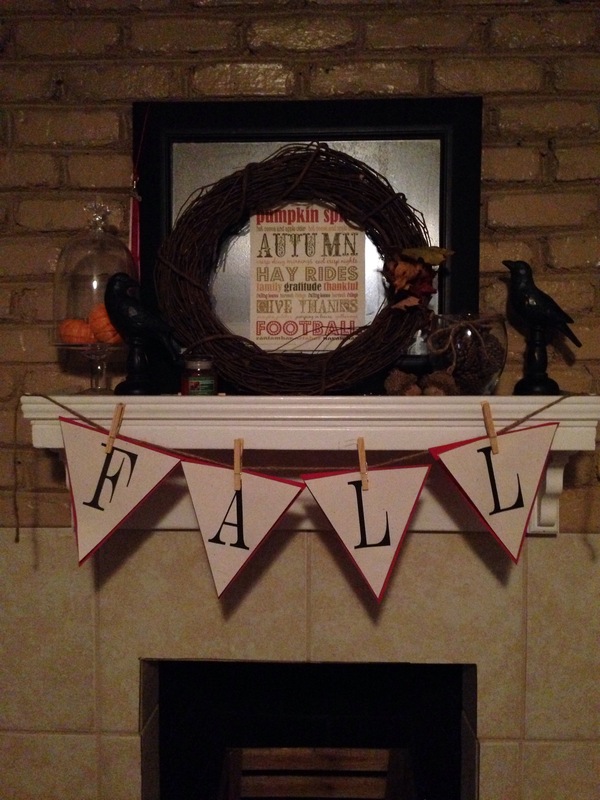 I just recycled a few mini pumpkins from Halloween, collected some leaves and pine cones from my yard, made a quick banner and printed out the Fall subway style print I found on Google Images. Not bad. I can’t wait to try my hand at a Christmas mantle. Thanks for stopping by! Please leave comment, follow, like and share! I added a few more things to my mantle. 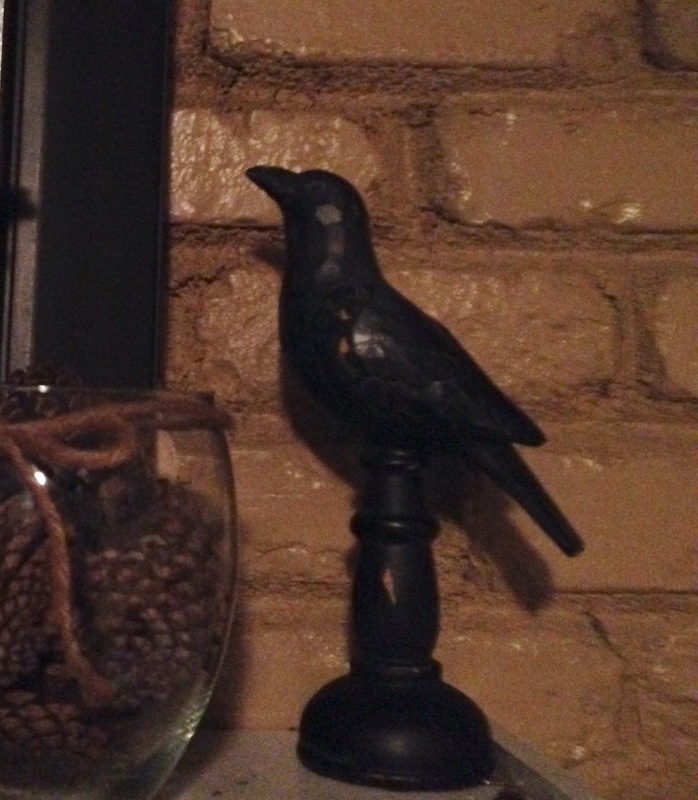 Check out the great black birds I got at Hobby Lobby for 80%. So my last post disappeared .. Where did it go? I’m tired and it’s late so I will hopefully repost it tomorrow.. Sorry for the inconvenience. Halloween is almost here! 🎃 Are you excited? I know I am. I love to see all the wonderful costumes, the happy little Gouls and Goblins 👻 trick or treating and ofcourse those scary Halloween decorations! I did decorate my mantel this year for the first time. It started out like this.. 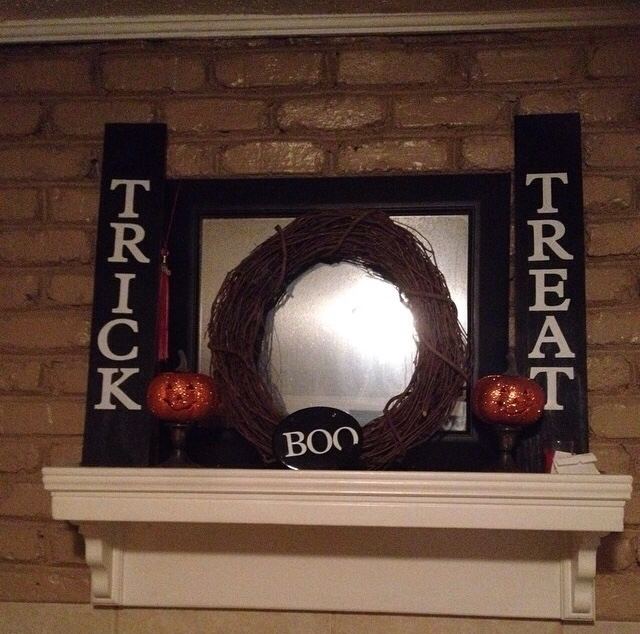 I made the Trick or Treat sign with left over wood and my Cricut. 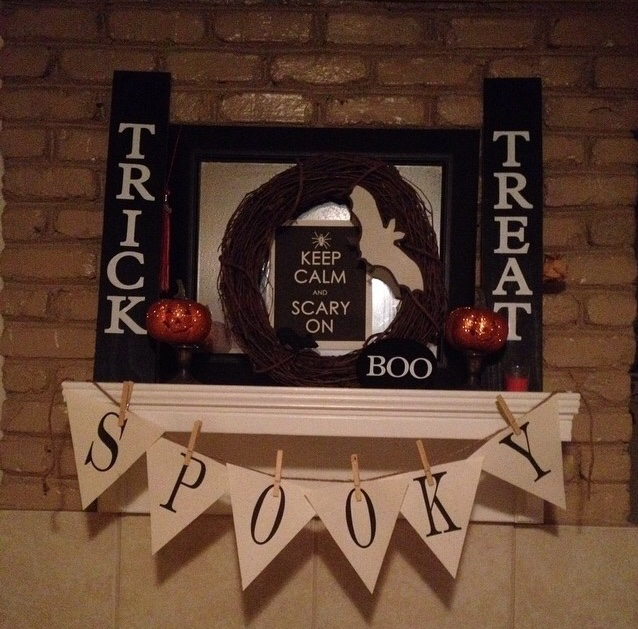 The pumpkins are courtesy of the Dollar Store and the Boo plaque was made out of a plague that once said Home Sweet Home or something to that extent with birds and flowers ( think grandmas style ) that I also found at the Dollar Store. It was a little boring to me and the more I looked at, the more it needed something.. 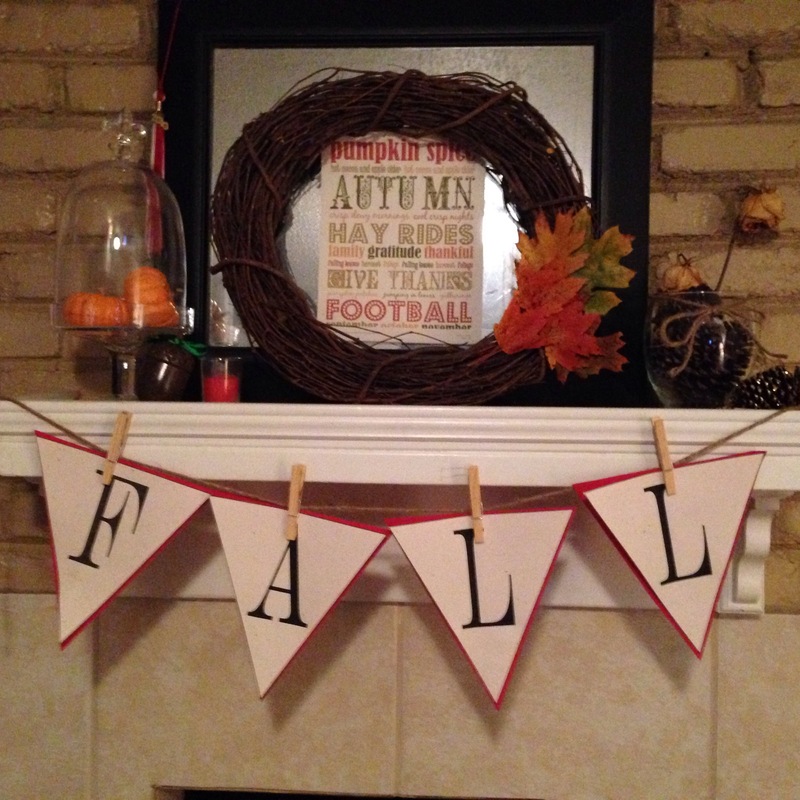 I decided to add a banner I made from using printable banner letters I found over at Shanty2Chic’s blog here. 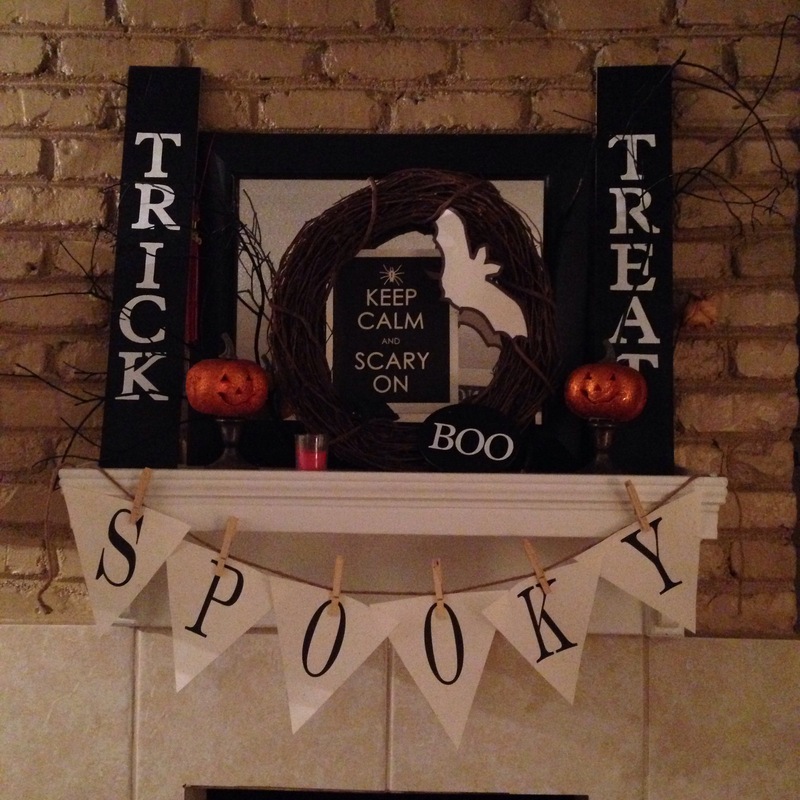 I also added a cute print I found on Google Images and a cut out of a bat, also found on Google Images. Looks great! Of course I couldn’t leave well enough alone and I added some branches from my yard that I just spray painted black! Can you see them? What cha think? Thank you for stopping by! I hope you and the littles enjoy your All Hallows Eve!! I was looking through one of my favorite bloggers site, The Lettered Cottage,when came I across this post. Layla found this handsome devil at World Market. While it was inexpensive and I could have just purchased one myself, I decided I could make one with items I already had on hand. 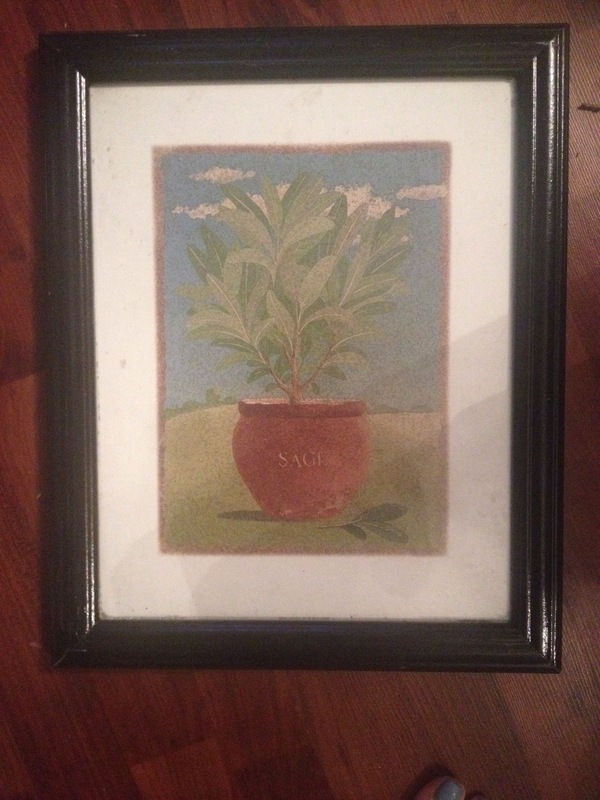 My sign started out as a herb picture that once hung in my Italian inspired kitchen years and years ago. I have two actually, basil and sage. I had been hoarding saving them for just the right project and I decided that this was it. 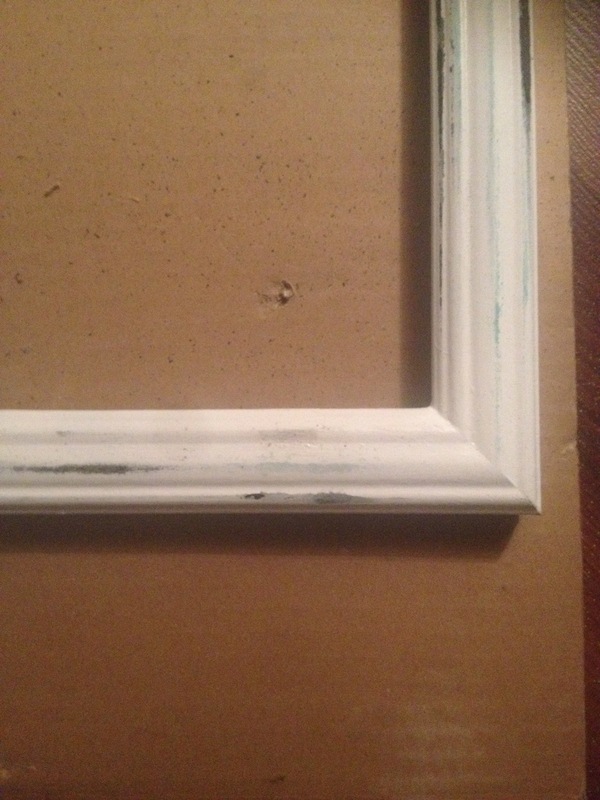 I took the picture apart and primed my frame first. After a few hours of letting it dry in the sun, I took my palm sander and distressed the frame. 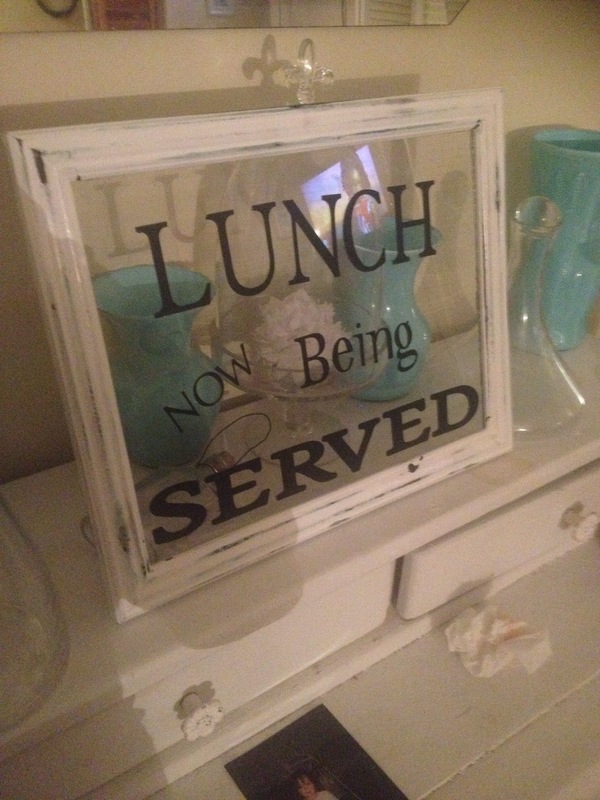 I cut out the words with my Cricut and applied them to the glass that came in the frame. I, of course, kept the original picture. I’m sure I can find a use for it, lol. 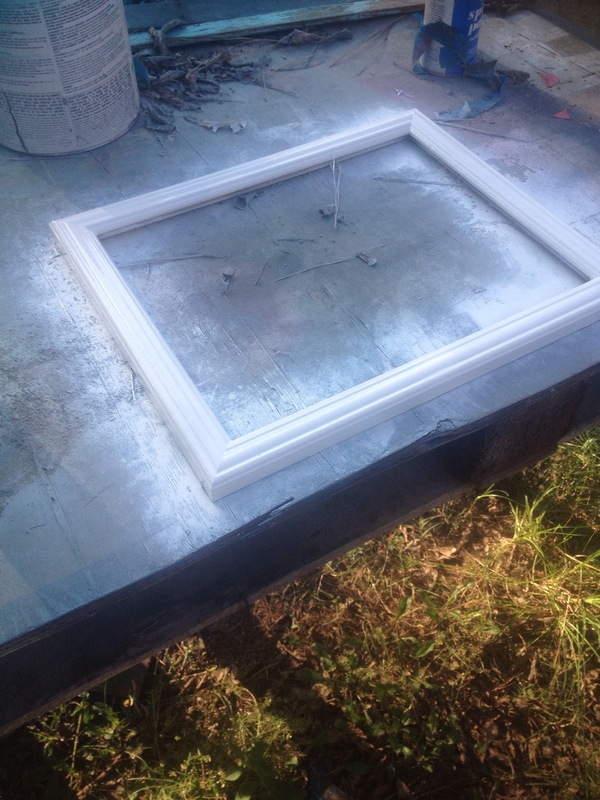 I glued the glass to the frame with some liquid cement, I picked up at my local Dollar Tree. Layla didn’t like the wire hanger the picture came with so she ended up trading it out with some twine. It looks super cute. Don’t you just love her backsplash? I actually like the wonkeyness of the wire, unfortunately I have none on hand. I probably should have waited until I finished my sign but I was so excited how it’s turned out so far, I just couldn’t wait to post! 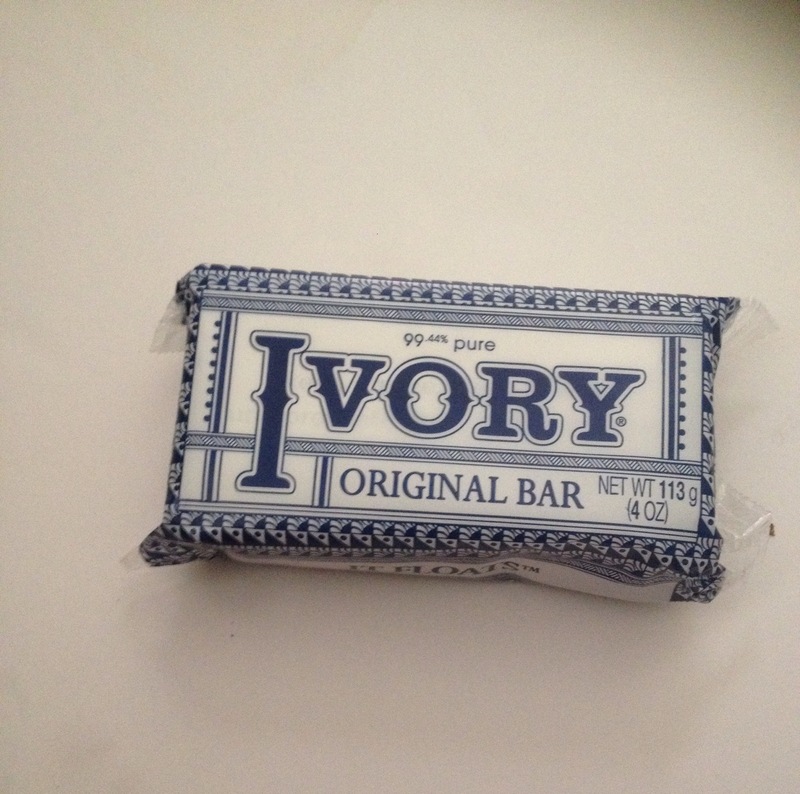 I am so excited by this soap I found today at my local Dollar General for only, you guessed it, a dollar. I love the retro packaging! 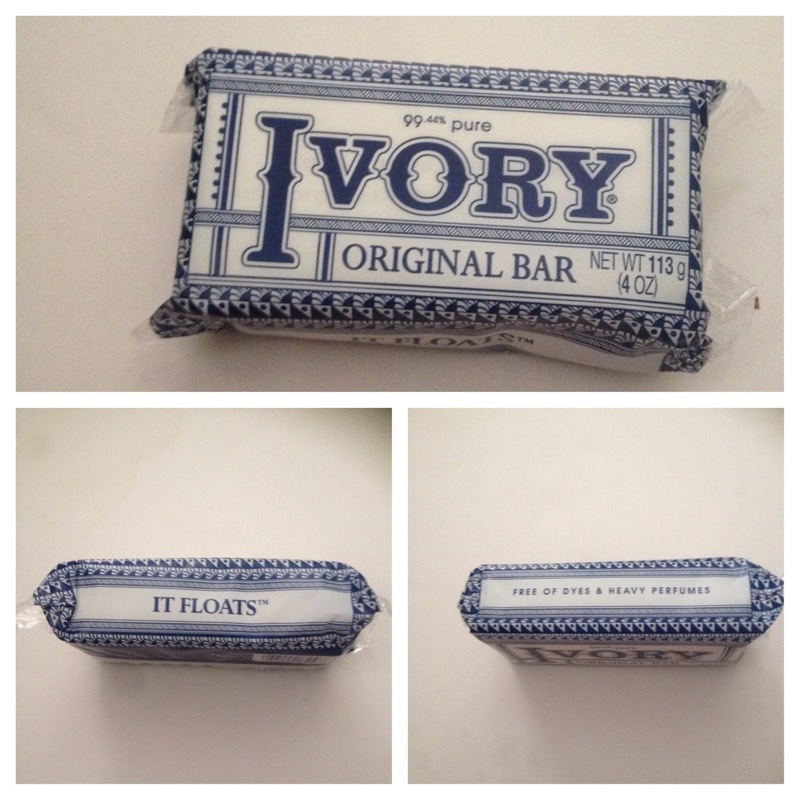 I have eczema so this soap is perfect for my sensitive skin. I don’t know why I just bought one today but I plan on stopping by there again tomorrow and buying them out,lol. 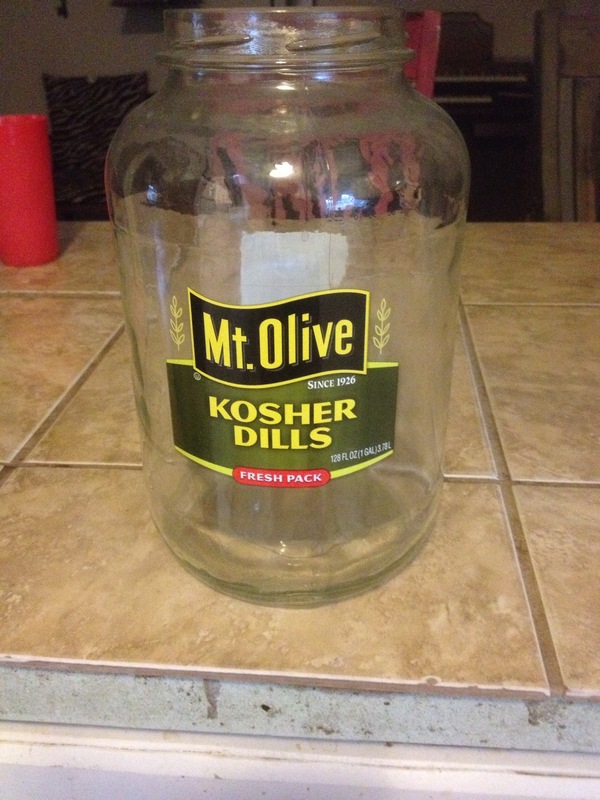 Not only can my whole family use this but I can see it in a homemade gift basket in the near future! 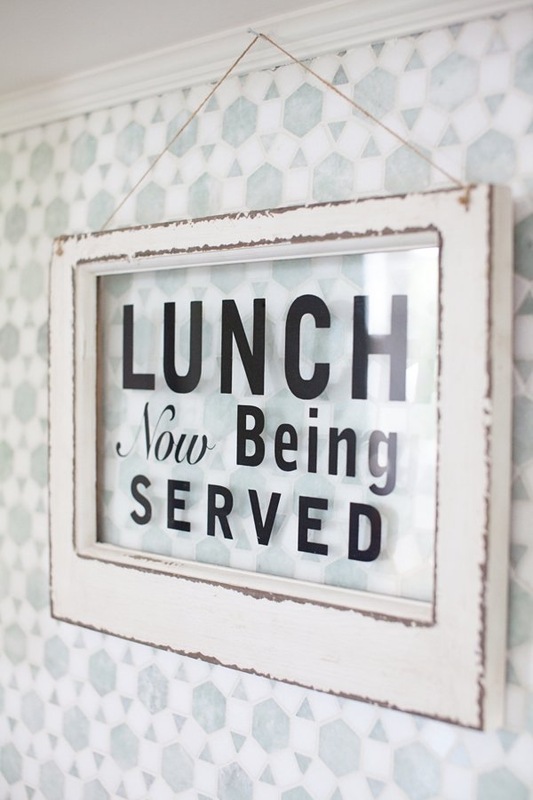 If you’ve seen my sign, Sweet Tea Served Here then you know I love sweet tea. Some would say its so addicting it’s like liquid crack to some of us Southerners, lol.. If you haven’t seen my sign you can check out it here. My grandmother, who’s been on my mind lately, inspired my next project. 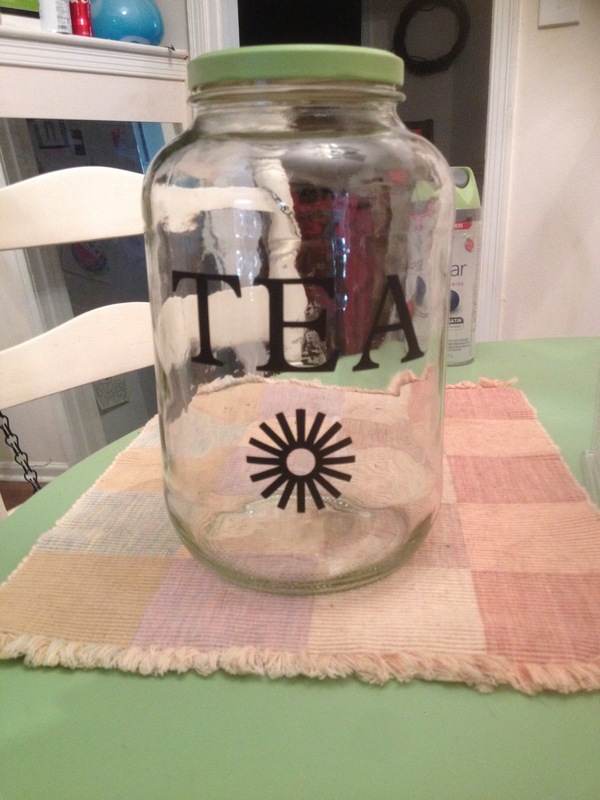 Sun Tea is something my grandmother made every summer, a family tradition if you would. I decided this summer I will carry on that tradition. A lot of people grill outside during the summer, not only for the taste of BBQ but to keep our houses from getting any hotter than they already are. 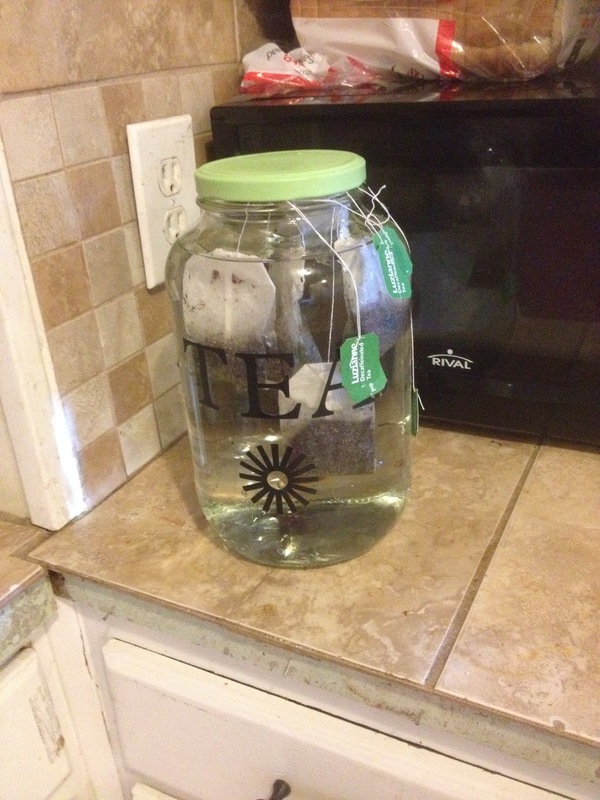 The same idea with Sun Tea. Instead of heating up the stove by boiling the water for the tea, we have learned to let the hot summer sun do all the work. 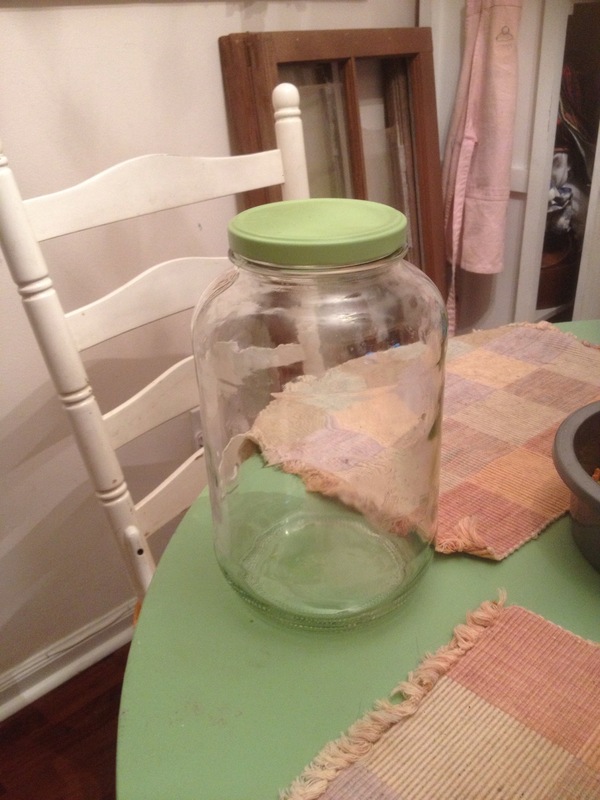 I started with a big ole pickle jar. I washed it several times by hand and then ran it through the dishwasher a few more. Nothing ruins tea then a hint of pickle taste in it, lol. 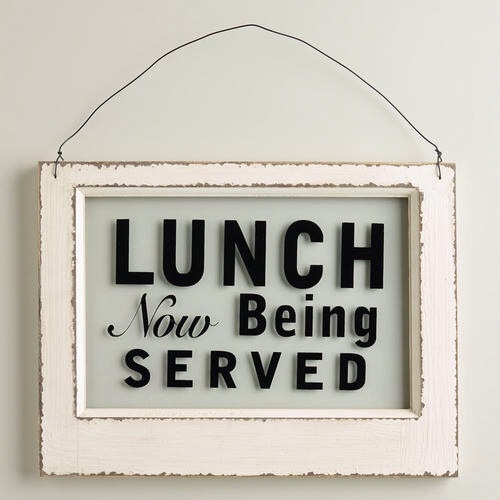 Ofcourse I had to make it pretty, so I powered up my Cricut and got to work. 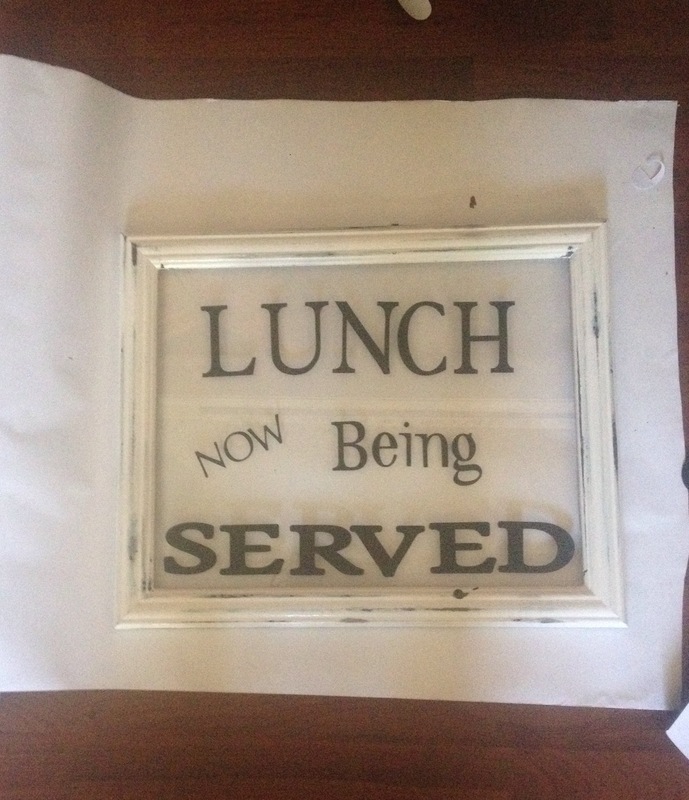 I used my Plantin Schoolhouse cartridge an cut out the word Tea in black vinyl. I also used my Home Accent cartridge to cut out what I thought could pass for the sun, lol. Painted the lid with some green spray paint from my stash and she was ready to go. 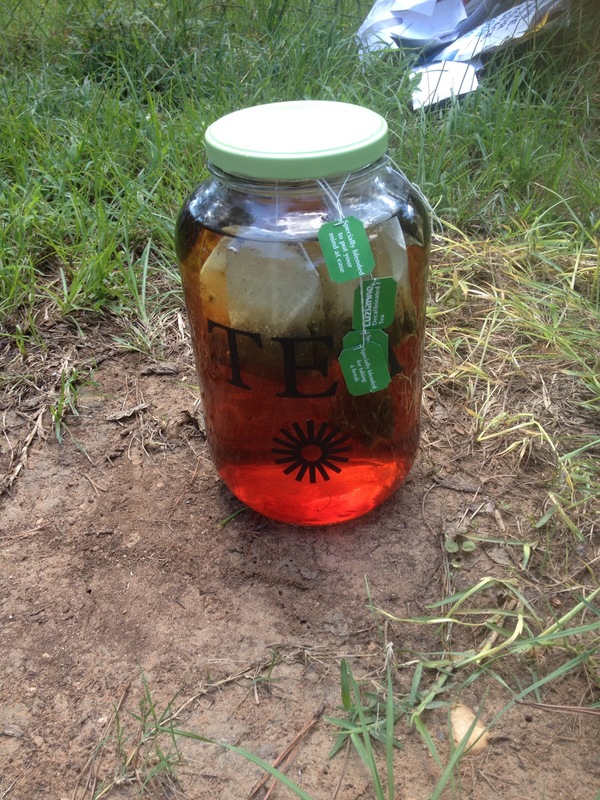 I placed 6 tea bags inside the jar and set it outside next to my Salsa Garden . Just an hour later and it looks ready. I will let it sit a few more hours before bringing her inside, adding a cup ( or 2 ) of sugar and popping her in the refrigerator.